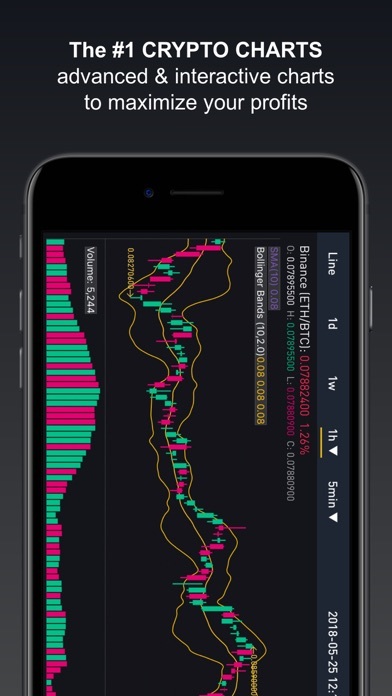 BitScreener streams 2000+ coin prices in real-time from 200+ crypto markets & trading platforms, including Binance, GDAX, Coinbase, Bittrex, Kraken, Gemini Bitcoin, Bitfinex, Kucoin, YoBit, Binance exchange, Gatehub, CoinEx, Bibox, Gate.io, CEX.io, etc. 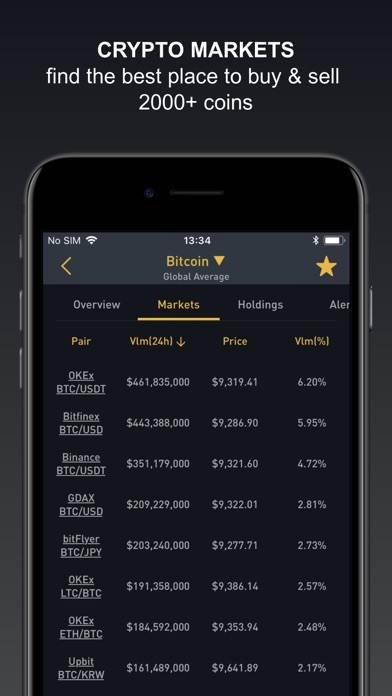 (See the full list below) UNIQUE FEATURES: ***REAL-TIME CRYPTO PORTFOLIO*** BitScreener is the only app available on App Store that gives you up-to-second profit/loss on your investments - Support manual adding mode, API integration from the most popular exchanges & CSV files importing/exporting - Track 1H, 24H, 1W, 1M & all-time Profit/Loss in REAL-TIME (only at BitScreener) ***REAL-TIME CRYPTO MARKET*** - Real-time 2000+ crypto prices & coin stats: Bitcoin, Ripple, Litecoin, Electroneum, Ripple, Ethereum, Dogecoin, Miota (IOTA), etc - Up-to-second coin market cap, Bitcoin & Altcoins ticker - Support 200+ crypto market exchanges - Support all trading pairs on any market, such as Ethereum (ETH)/BTC on Binance, Litecoin (LTC)/EUR on Coinbase, Ripple (XRP)/ETH on Bittrex, Electroneum (ETN)/USDT on Cryptopia, etc. 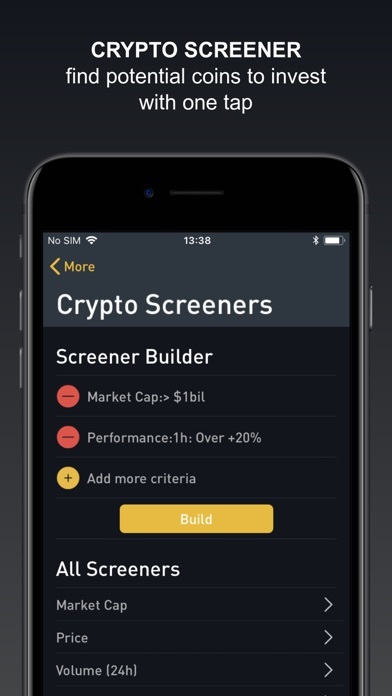 ***ADVANCED CRYPTO SCREENING TOOL*** One click to find potential coins to invest by many criteria. 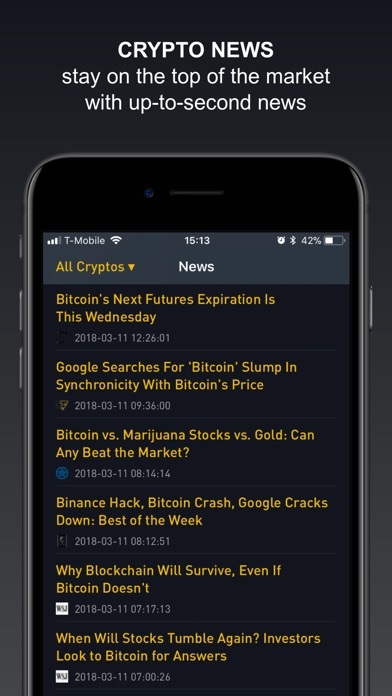 - Crypto Price Up and Down - Coin Market Cap Up and Down - Performance, ages, type, exchange, etc ***INTERACTIVE & POWERFUL CRYPTO CHARTS*** A high-resolution & full-screen bitcoin & altcoin charts with hundreds of technical indicators. - Interactive drawing tools - Support multiple chart types (Candle Stick, Bar, Line), Indicators (ADL, ADX, Aroon, etc. ), Overlays (SMA, Bollinger Bands, etc.) 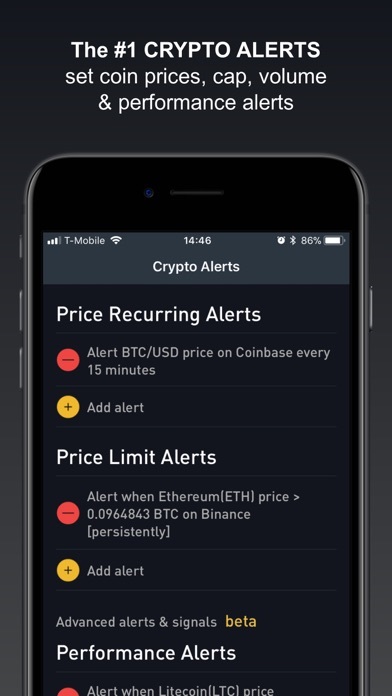 ***The #1 CRYPTO ALERT*** Stay on the top of the market with SPECIAL ALERTS that only available on BitScreener - Performance 1H, 1D, 1W, 1M, 6M alerts - Volume 24h, coin cap alerts - Recurring price alerts every 15 min, 30 min, 1h & 2h - Price limit alert - ALARM option to wake you up at midnight ***CRYPTO INFO*** - Links to Crypto Exchanges to buy/sell coins - Full coin profile: website, age, algorithm, Github, etc. ***CRYPTO NEWS & DISCUSSION*** Breaking cryptocurrency news from all reliable sources like Coindesk, etc. ***REAL-TIME CRYPTOCURRENCY CONVERTER & CALCULATOR*** BitScreener is the only app that you can: - Calculate real-time quotes: coin to coin, coin to fiat, fiat to coin and fiat to fiat. - Save & sync your converters on multiple devices *** HOME WIDGETS *** - Real-time Watchlist Widget - Real-time Portfolio Widgets Full list of supported markets: Binance, Coinbase, GDAX, Kucoin, Poloniex, Bittrex, Bitstamp, Coinsquare, QuadrigaCX, Kraken, Coinspot, BTC Markets, Coinjar, Zaif, Exmo, Bithumb, Coincheck, CoinExchange, Cryptopia, HitBTC, Bitfinex, Quoine, OKEx, OKCoin, CEX IO, Gemini, Bitso, Paribu, BTCTurk, Koinim, Coinone, bitFlyer, Korbit, Fisco, Livecoin, Qryptos, Huobi, Koinex, BX Thailand, Gatecoin, Coinnest, Gatehub, Gate.io, Bitonic, Remitano, Bitcoin Indonesia, YoBit, EtherDelta, Bitsane, etc. Disclaimer: BitScreener is not responsible for profits, revenues, or data and financial losses. All the websites or brands mentioned above are not affiliated with BitScreener. 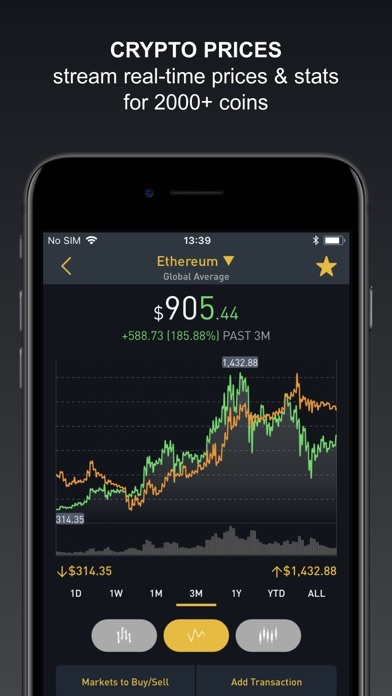 This app uses publicly available API from crypto markets and conforms to terms and conditions to perform queries and present data. I use this app daily, but recently it got stuck on the loading screen and completely stopped working. I tried killing it, restarting the phone to no avail. Eventually fixed it by deleting and reinstalling. Thought it was a one time thing, but it just happened again. Can’t get past the loading screen. Update: happened a third time in 2 weeks. Seems this app is becoming unusable. 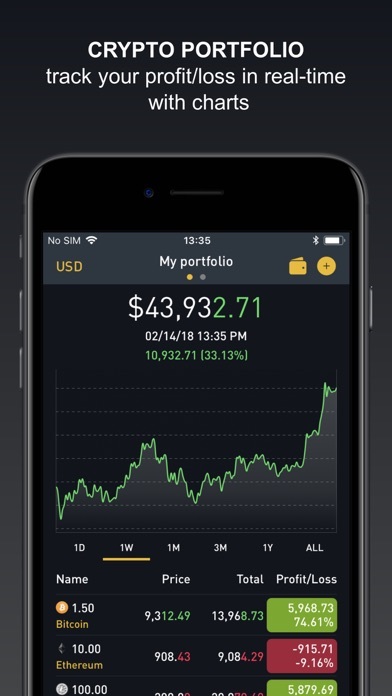 I was searching for a portfolio app to add all my investments in to it , I checked like most of the apps out there but I never seen any thing like this in the apple store....I highly recommend this app for traders and investors in this field. Can you guys add more alerts like rsi alerts and macd. It would make this app even better. I like the application but lately it’s hanging up and not opening. Have to delete and reinstall. Happening regularly. What’s going on... used to be stable. Why do you need my email just to do notifications? You say you don’t store personal information, but I don’t believe you. Not in this day in age. Annoying AF auto-rotate hijack with this app! Use an iPad. Hold in landscape mode. Try to edit anything... save or cancel and app hijacks orientation and forces back to annoying portrait mode. Over. And over. And over again...... Please fix! it quits when you try to add the KEY API. More by BITSCREENER PTE. LTD.